Winter-weary as we are and with a chance of snow lingering in Tuesday’s forecast, spring is struggling to keep its foot in the door. In downtown Little Rock, trees are showing lots of bud swell, with blooms and leaves ready to burst forth. Further west, on campus, daffodil leaves have pushed above the soil. Here on the mountain, we’re a few weeks behind. However, spring is showing its colors. Below are photos taken this morning. 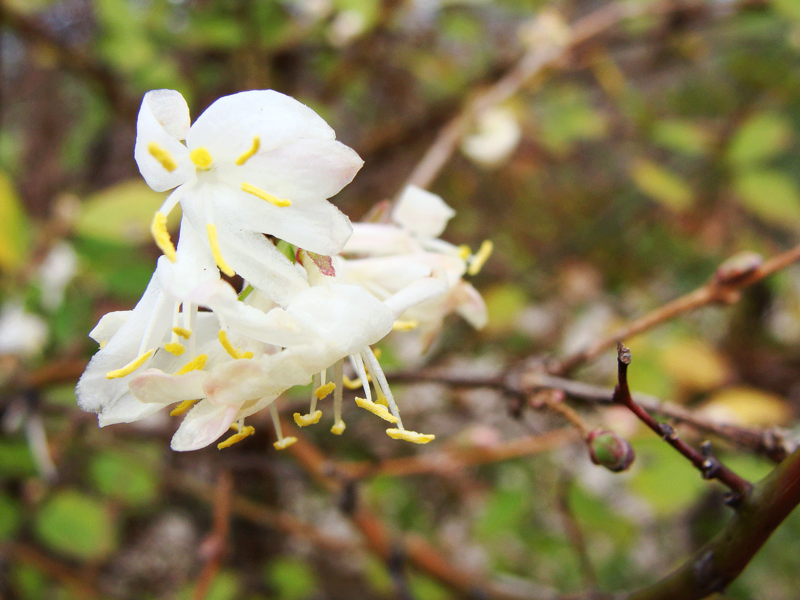 SWEET — This very sweet smelling shrub is among the first to bloom each spring, but this year, it preceded even the violets. 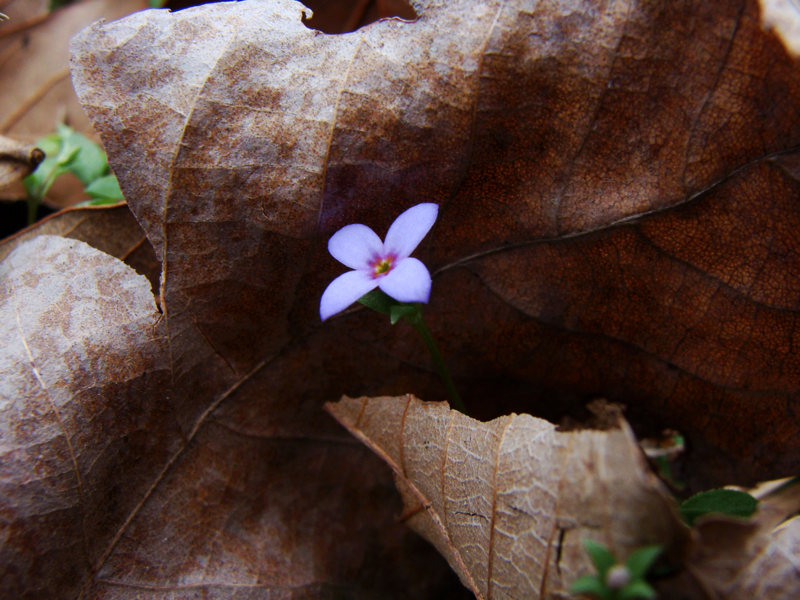 PROTECTED — A bluet pushes up between fall leaves. 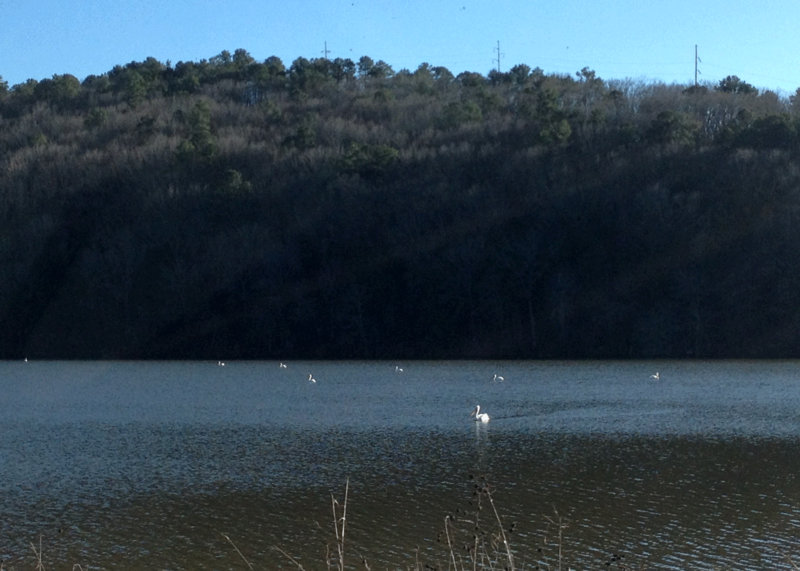 PELICANS — White pelicans on the Arkansas River near Altus. The last few weeks have given Arkansans many opportunities to perfect those snow- and ice-handling tactics. Even so, any mention of wintry precip can generate quite a buzz. So much so, that one of our local National Weather Service forecasters has taken to calling mention of flakes an “excitement snow.” And some of the local TV meteorologists talk about “French toast obsession” as a metaphor (or is it a simile?) for the pre-storm shopping panic as customers clear the shelves of milk, eggs and bread. However, where snow is concerned, we still we have a long way to go. 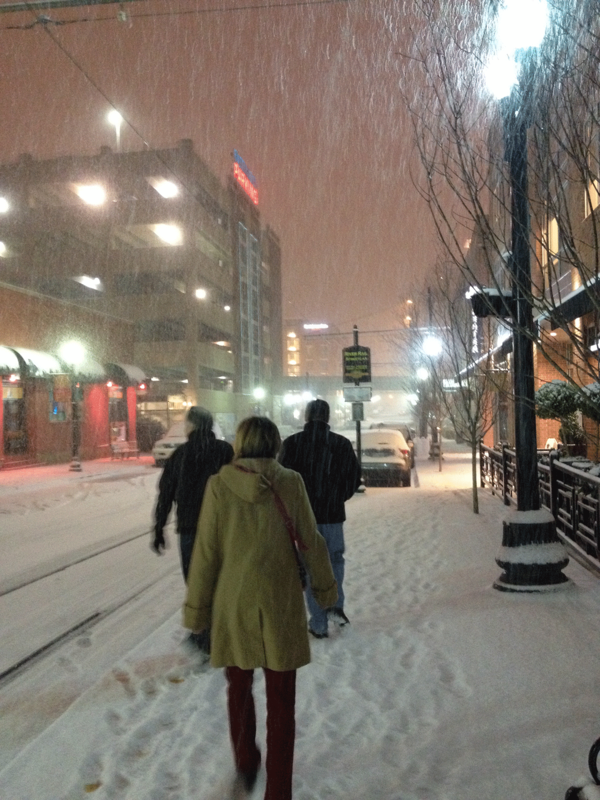 Out late celebrating my husband’s birthday with friends, we finally left the restaurant when there was about an inch of snow in the ground. What would normally be a 30-minute drive home stretched into an hour-plus and with each minute moving westward, the world became surreal. Cars in ditches. Cars on curbs, and cars simply abandoned in the street. By the time we got to halfway home, we felt as if we were driving around the set of “The Walking Dead,” as drivers who had abandoned cars simply wandered in the middle of major arteries and in front of still moving traffic. Scary. 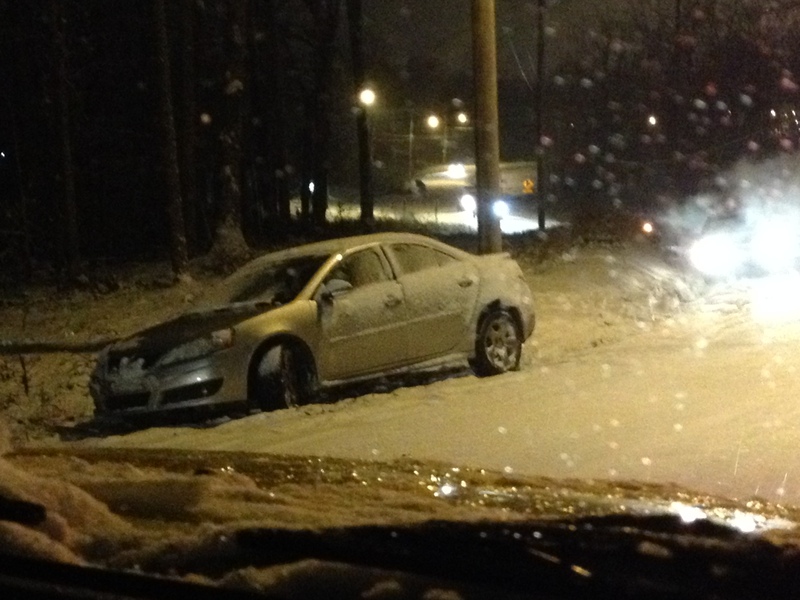 Little Rock PD worked 151 accidents the night of Feb. 8. That doesn’t count the ones they couldn’t reach. Two days later we braced for another 5-6 inches in a storm system that turned out to be most unpredictable. During the early part of the prediction phase, the inch count inched up from 3 inches to maybe 6. Then somewhere in late afternoon, one of the TV forecasters broke ranks saying the storm might not bring anything at all. The state held its breath — made plans for school and office closures, cancelled evening activities. We waited. And waited. 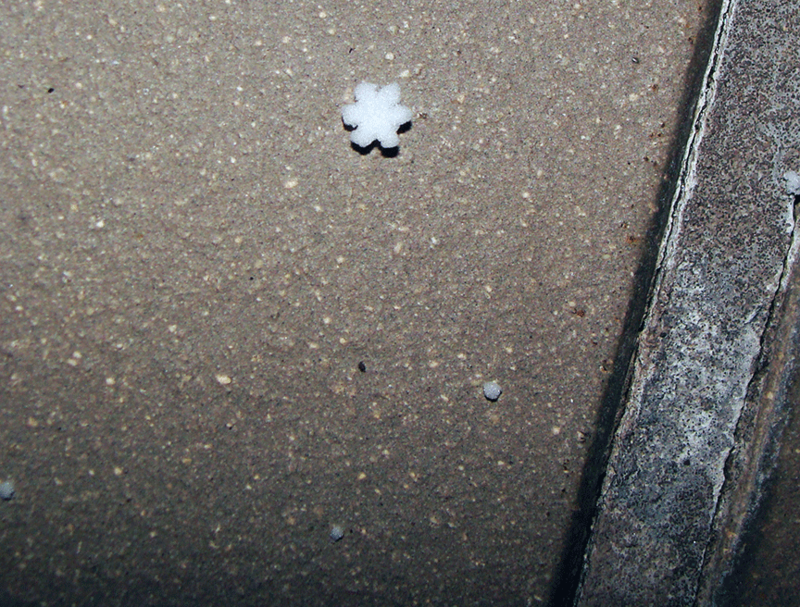 Finally around 9 p.m. or so, a big fat snowflake fell on the deck. Then a few dozen cousins fell too. Then it stopped. Snow it goes in the Southern winter. 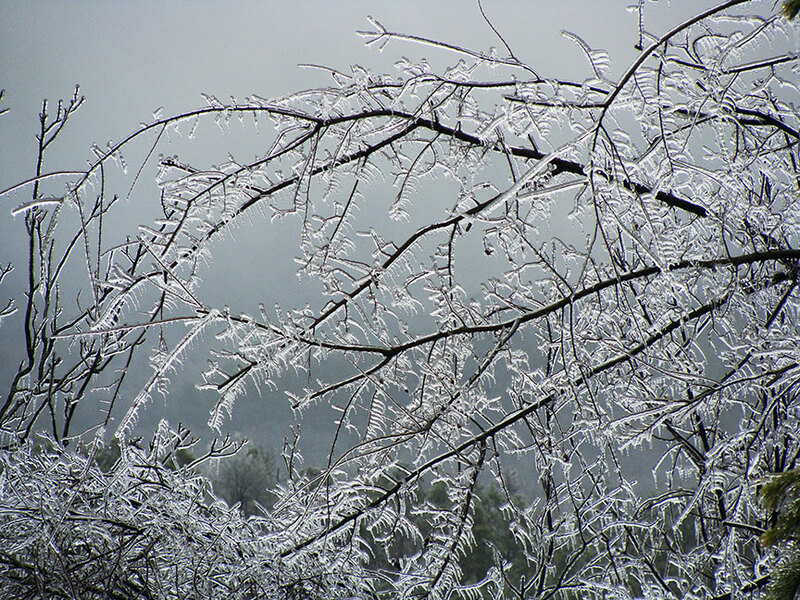 ICED — Ice-covered branches on the mountain. DITCHED — One of hundreds of cars abandoned during the Feb. 8 snow storm. DOWNTOWN — Downtown Little Rock gets a rare snow covering. ONE — A single fat snowflake hits the deck. We have a new neighbor — a pair of house finches who have taken up residence in our patio heater, displacing or replacing, a wren who had spent several season nesting there. Mr. H. Finch takes a moment away from homemaking to rest on the deck railing. 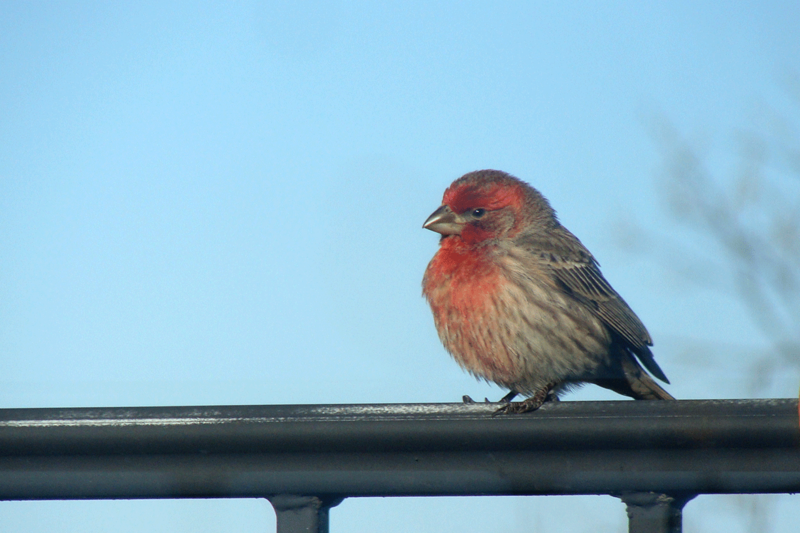 ON THE RAIL — Male house finch checks out the world from the deck railing. It’s funny how cultural connections are made and often begun in the most unlikely ways. For example, last night, we picked a televisual feast from Roku and as is usual for us, it was a “cult” horror movie called “City of the Dead,” starring Christopher Lee as the lead undead guy. The movie was set in a rural Massachusetts town with a perma-fog and equally permanent darkness, populated by a band of survivors of 17th century witch hunts. In the movie, Feb. 2, which is also Candlemas, is an important day of sacrifice for these witches being the day halfway between the winter solstice and the spring equinox. (Not to mention that it was their way to irritate the local time-wearied clergyman). In Christianity, Candlemas commemorates the ritual purification of Mary 40 days after the birth of Jesus. Pre-Christian Celts celebrated the day as Imbolc, a day linked to the gestation of ewes and lambing. Which brings us to a more local tradition — Blossom, Perry County’s prognosticatin’ groundhog. Caretaker Tamara tells us this afternoon that “Blossom did not see her shadow today. She didn’t even peek outside!” (Search our blog for “Blossom,” and you’ll see more about our little local garden-thievin’ celebrity). The local weather was cloud and rain, and if the Candlemas rhyme is followed, agrees with Perry County Blossom that spring is en route. We’re putting our money on our local folkways predictions no matter what that Pennsylvania whistlepig says.